Rah Rah was founded - as a trio - in 2007, whereby the elfin multi-instrumentalist and singer Erin Passmore as well as the shirt-sleeved guitarist and singer Marshall Burns were always the main characters. Over the years, the trio was expanded to a fiver; two albums were released with which Rah Rah made a name for herself in her native Canada and won prestigious awards such as the "Best New Canadian Band" or the "Best New Alternative Band". On the rest of the planet, however, the band was largely unknown. This will now change with the third plant. Rah Rah and her dedicated management are planning a global offensive. 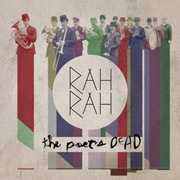 This could be crowned with success, because with "The Poet's Dead" the quintet is in the well-mown alternative folkpop field of Arcade Fire, Mercury Rev (their gentler version) and the classic Crosby, Stills, Nash & Young. This microcosm is sometimes lively and raw, but thanks to pretty two-part singing it's also nice and fluffy again. This may not be earth-shattering music, but it is pleasantly relaxing. With fans of the classic Yes, Billy Sherwood didn't suffer well. As Rick Wakeman's successor, he was involved in albums that do not necessarily belong to the silverware of the prog kings. But one would be wronging the busy multi-instrumentalist if one would only measure him by that.